Josh Gilbert Debuts On Billboard Christian Soft AC Charts! 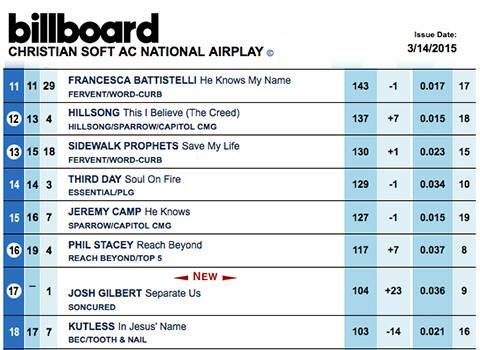 Yes you heard right, Soncured artist Josh Gilbert debuts on Billboard Christian soft AC charts! Josh continues to amaze the Christian music industry as his first release to Christian radio makes it’s debut at #17 on Billboard charts. This fantastic song called “Separate US” reminds the listener that there is nothing that can separate us from the Love of Christ. Josh is now on his 2nd week in the top 20 on Soft AC charts and we are praying for a top 10…who knows how far the Lord may take this song! Make sure to keep Josh in your prayers as we continue to promote this song nation wide. Separate Us Debuts At #17 On Billboard Soft AC Charts! Please make sure to call, email and post on the Facebook page of your favorite radio station requesting Josh Gilbert, Separate Us! To book or hire a Christian band contact us now or visit our friends at BookChristianBands.com to get a free quote!